Our unique moisture pads are made from untreated wool from Pacific Northwest free range sheep. The sheep are not treated with antibiotics or hormones. They free range graze on lush fields that is not treated with pesticides or herbicides. This pure wool is felted here in the United States to create a perfect pad to resist liquids. Softer than competitor wool pads so you don't get that itchy feeling. No treatments, no plasticizers. 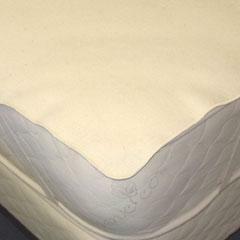 Natural Elastic straps to put on any mattress. You can machine wash ours on the hand wash delicate setting - cool water as we oversize them to allow for slight shrinkage. Hang dry indoors. Dries fast. Urine does not grow bacteria on these, so only wash if soiled.